Working the night shift as a temp in a high-rise cubicle, Erik Orton knew something had to change. He felt the responsibility of providing for his wife and their five children--the youngest with Down syndrome--but craved a life that offered more than just surviving. Watching the sailboats on the Hudson River during his sunset dinner breaks, Erik dared to dream. What would it be like to leave the hustle of the city and instead spend a year on a sailboat, somewhere beautiful, as a family? 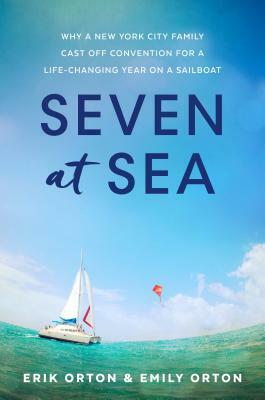 Despite having no sailing experience, his wife Emily's phobia of deep water, and already stretching every dollar to pay rent and buy groceries, the family of seven turned their excuses into reasons and their fears into motivation. Sure, they would miss their friends, they could go broke, they could get injured or die. Worst of all, they could humiliate themselves by trying something audacious and failing. But the little time they still had together as a family, before their oldest daughter left for college, was drifting away. The Ortons cast off the life they knew to begin an uncertain journey of 5,000 miles between New York City and the Caribbean, ultimately arriving at a new place within themselves. A portrait of a captivating and resilient family and a celebration of the courage it takes to head for something over the horizon, this is a deeply compelling story--told alternately by Erik and Emily--for all those who dream of leaving routine in their wake. ERIK ORTON is an Emmy Award-winning writer and former-Broadway tour manager. He was raised in Germany and the suburbs of Washington D.C. He has produced various musicals Off-Broadway. His original musical Berlin won an Emmy Award as well as a CINE Golden Eagle Award and Bronze Telly Award. In 2018, he climbed El Capitan--the tallest granite cliff in the world--got scuba certified, and learned to surf. EMILY ORTON is a former English teacher turned homeschool mom. She speaks and writes about living with purpose. Her writing is featured in Dare, Dream, Do by Whitney Johnson. Curiosity has led Emily to become a rock climber, a sailor, a scuba diver, a world traveler, and most recently a surfer. Erik and Emily continue to learn, grow and travel with their five children. They love to gig as a family band when their two oldest children are home from college, and occasionally post music videos to YouTube. They are currently traveling Europe by sailboat and VW van with their younger children. They blog together at fezywig.com and make their home in New York City.